A new study from London shows that building good bike facilities can have a positive impact on housing development and influence where people desire to live. The RACT has released five scenarios for Hobart’s transport future and is asking people to comment on each of them. New research has found that people who ride bikes, walk or take public transport spend 40 per more each month in local shops than people who drive. Brisbane has been chosen as the host destination for next year’s International Cycling Safety Conference 2019. Melbourne has joined other advanced global cities with a move towards lower, 30km/h urban speed limits from September this year. o wonder there is not enough money being spent on bike infrastructure – it’s all being wasted on numerous, politically inspired projects that just don’t stack up. Two new cars have met ANCAP's upgraded five star safety standards that include greater protection for bike riders and pedestrians. Bicycle Network brought together bike advocates and stakeholders from across Sydney to discuss issues and concerns arising from major construction works. Brisbane’s Bicentennial Bikeway has made the world's top 10 most popular cycling routes according to live electronic bike count data. What does it take to switch transport choices? Tasmanians will be the guinea pigs inr understanding what it takes to get people out of cars and into active transport and public transport, in the new Health by Stealth research project. Bicycle Networks new e-bike flyer tells you everything you need to know about how an electric bicycle operates. Bicycle Network is reminding everyone to avoid the front carriage when taking their bikes on the train. Bike racks around bus stops are being used to help connect commuter routes in and around Darwin. 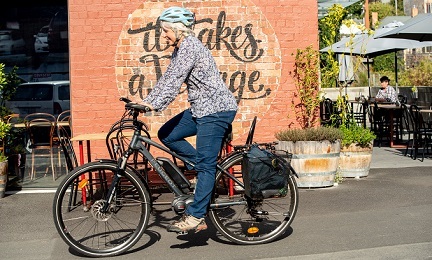 Allowing footpath access increases bike riding by women and children, fresh evidence gathered by Bicycle Network has revealed. The AMA has called for tougher penalties for distracted drivers who use mobile phones, but also have some advice for bike riders.